← Friday Create Along, well sort of. I LOVE creating, its like milk to my coffee, and I like sharing. My blog is a work in progress, following exploration and adventures. Photography, needlepoint, sewing, knitting and more. I love colour, but have slowly started to appreciate duller tones, perhaps when it comes to legwarmers. Check out my blog, pinterest, or shop. 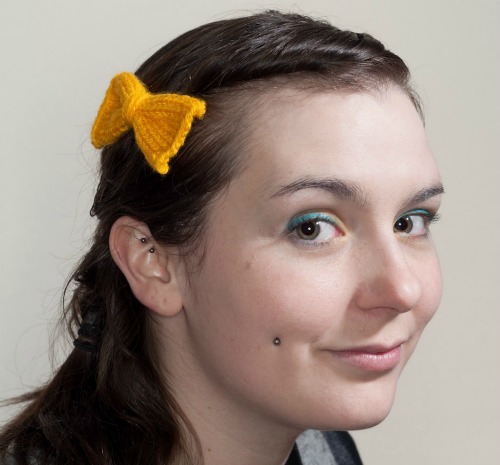 Giveaway – Yellow Bow hair clip (shown below in photo). To enter just check out the Barnicles shop and tell us your favourite item in the comments below. – Please leave one comment per entry and maximum of 2 entries. – Giveaway is open for a week until Friday February 3rd. This entry was posted in fun finds and tagged crochet, giveaway, hair clip. Bookmark the permalink. 8 Responses to Barnicles post and Giveaway! The Bow necklace is beautiful from your shop! i really like the Bright Yellow Knitted Fingerless Gloves. but that bow is my true fav! One of my fav items are the fingerless gloves! I always sacrifice warmth for being able to use my iPhone! I also love the beanie!